I was somewhat starting to feel deprived of nice swedish fashion those last few months. You know, the H&M kind. 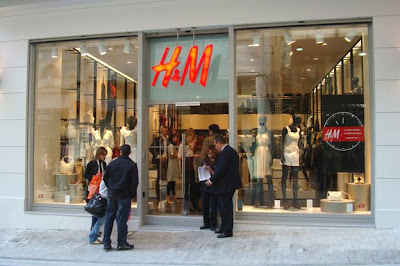 The December events here in Greece had left both the Stadiou and Ermou H&M stores destroyed. Having learned later on that they were both not destined to re-open, you understand why I was starting to get anxious. Had the big heads at the H&M headquarters in Sweden decided we are not worthy of a new store? Were we doomed? But alas, strolling on Ermou one day back in March, I spotted the familiar two-letter-and-ampercent red logo. On a construction site, nevertheless, but there it was. And stating April 9th as the opening date. And what a happy day the 9th of April was! (Actually, I was there the day before, for the press party, but let's pretend it was the opening day, ok?) I started my mission by systematically scouring all three women's fashion floors to gather my prey. First impression: It carries the cosmetics line! Not so sure of the quality, but oh-so-cute packaging. Go for the make-up bags, I say. 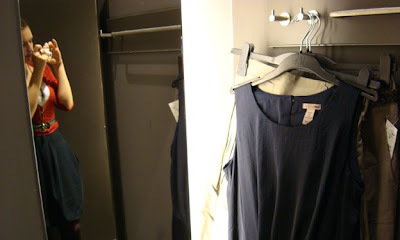 As for the actual clothes, t also looks like it stocks more of the sophisticated and better quality collections and less of the cheapo, multi-coloured stuff I was sick of seeing at the previous Stadiou flagship store. A good change. Straight to the fitting rooms. Nice and roomy, as always. My prey lies there, waiting for me to devour it. 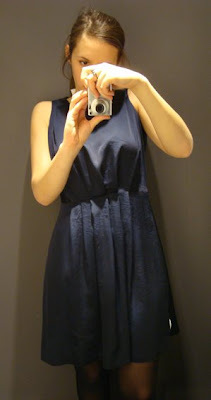 A very nicely fitting blue dress, unfortunately made of 100% polyester, therefore not a wise choice for Greek summer weather. 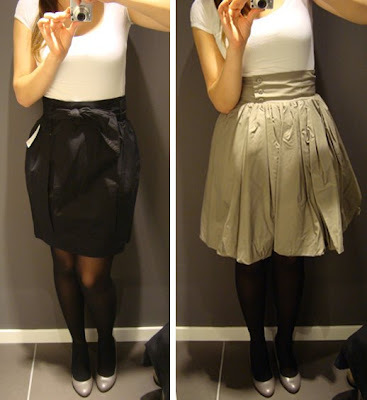 A black tulip skirt in nice thick cotton, comes with its own fabric belt to tie up as a ribbon. And a cream high-waist full skirt with a balloon hem. Both in my closet as we speak. SMALL UPDATE: Reader Staraki asked to know what I'm wearing in the first pics, so I thought I'll just reply here, in case anyone else is interested. 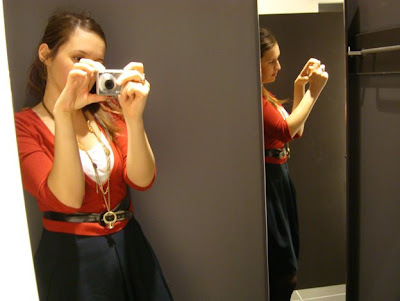 I'm wearing the Mango skirt and cardi outfit I posted back here, but instead of the grey skirt, I'm wearing the same one in blue, as seen here. Hope I helped! kego meta apo toso kero apousias h&m to perimena pio fadasmagoriko(aka pio pola rouxa pio orea perisoteres afkeries)....parolafta ipekipsa kego se agores..
Killah: Hehe, I'm heading back home for Greek Easter holidays and unfortunately The Dresses are not in my suitcase. Can we be patient until Tuesday? lopi these photos show us great things about h&m clothing and actually make me see them in a different- better- way! i will check out soon the new store!! i also love your outfit in the first pic as well!! skirt based outfits is my love lately but no luck on finding nice skirts often! can u tell us product details for the first pic as well?? εμενα το στυλ μου μοιαζει περισσοτερο με αυτο του υπογειου στη σταδιου. So glad you nabbed those skirts - they're very Lopi! Will we see the dresses, too? The tulip skirt is <3 lopi! It looks so great on you! Oh my! That black tulip skirt is fantastic! oh I wish there was just one H&M in my whole country:))I would buy so many things! kai molis diabasa oti tha leitourghsei arxes mah kai mah erxomai athina ! Oh I love H&M!! I can't wait for the European H&M shops! Once again, thanks so much for your kind words girls! You really brighten up my day! Sal(and everyone else, for that case): Of course I'm going to show you the dresses! As soon as I return to my Athens closet, that is. oou: Αλήθεια θα ξανανοίξει? Yes! Ειχα ακούσει ότι δεν θα ξαναάνοιγε γιατί είχαν κάποιες διαφωνίες ο ιδιοκτήτης με την εταιρεία. Αν μπορείς, στείλε μου και από πού το άκουσες. Το έχουν ανακοινώσει επίσημα? πράσινη νεράιδα: Όπως βλέπεις, μάλλον εισακούστηκαν οι ευχές σου και θα ξανανοίξει το πολυαγαπημένο σου H&M Σταδίου. Αν και μην εγκαταλείπεις τις προσπάθειες, μπορεί και της Ερμού να φέρει τις πιο νεανικές συλλογές. when I look at your signature looks, I feel like you invented the high waist. It's SO you! I'm glad they're open again. I was wondering what would become of them. H&M is a necessity for life--or at least it feels like that! love both skirts. and i think i won't survive if h&m here closes. that's just me.